Center for Volcanology and Geological Disaster Mitigation (PVMBG) raises the status of Gunung Agung from level III (standby) to level IV (watch out). Rising status is set on Friday night (09/22/2017) 20:30 local time. Level IV is a fairly vulnerable level if it is very close to the crater of the mountain, the center of a mountain eruption. Because the possibility to avoid is very difficult, if a volcanic eruption occurs. 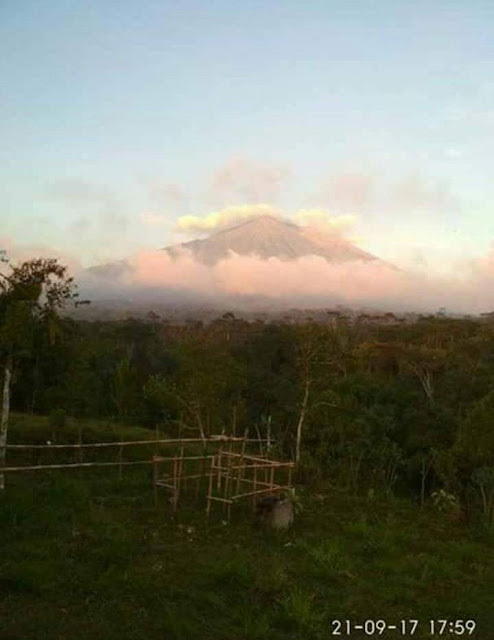 Seeing the latest development by observers of Mount Agung, volcanic seismic activity that occurred around Mount Agung is very high. With this status the volcano is upgraded from level III (standby) to level IV (watch out). With the stipulation of the alert status, the radius of citizens, tourists or climbers are encouraged not to operate at a radius of 9 km from the center of the eruption, including the sectoral extension to the North, Southeast and South-Southwest as far as 12 km. The magma pouch on Mount Agung is still at a depth of 5 km. But there has been fluid movement towards the surface. That is why the earthquake around the oldest mountain occurred and was felt up to several kilometers from the center of magma.